The very mention of the city of Liverpool in the United Kingdom means a lot of things to a lot of people. This popular city is synonymous with great music, sport, culture, tourism and business. In more relative terms it’s a great place to fly in and out of with our favourite simulators, in this case, Prepar3D v4. Liverpool is the fifth largest city in the UK and is situated in the Northwest of England. The main airport is, of course, Liverpool John Lennon airport (EGGP) named after the Beatles musician John Lennon. The airport itself is situated on the banks of the estuary of the River Mersey, providing passengers with scenic departures and arrivals. 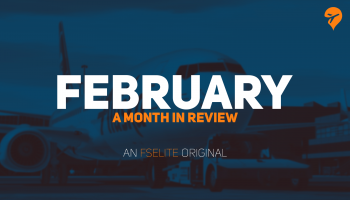 Handling over 5 million passengers in 2018, this busy single-runway, single terminal airport is a popular choice for people commuting to major European cities and seasonal tourist hotspots. Ryanair and Easyjet are the most frequent carriers operating out of Liverpool daily. Digital Design is a popular developer delivering scenery packages for all major flight simulation platforms including Prepar3D, FSX, and X-Plane 11. After several successful releases and an ever-growing positive reputation, albeit a small catalogue of sceneries, I am keen to see if they really do live up to the hype that the community has placed upon them. Ladies and gentlemen, this is Liverpool John Lennon airport for Prepar3D v4. The installation for this scenery is standard procedure when purchasing from simMarket. A name, serial number, and after registration, an authorisation code is all you need to get this package in your simulator. The SODE installer is also included upon installation. The first thing I usually look out for after installation is the use of a configurator tool. Immediately I had an issue locating it. After a good twenty minutes looking I gave up and asked for help on the Digital Design Facebook group. To be clear there was not a shortcut on my start menu either. So, after further inspection I finally found it. My Norton antivirus had quarantined the config.exe (so please be aware of this when installing). The configurator tool is still not easy to find as it is located in the root folder inside the data sub-folder. (\Lockheed Martin\Prepar3D V4\SimMarket\Digital Design-Liverpool P3Dv4\data\Scenery Configurator Pro). Once the configuration tool is running you are presented with a basic list of options, six to be exact. Three of the options are for the level of animated vehicles. Level 1 – No cars, Level 2 – Static cars, Level 3 – Animated cars. 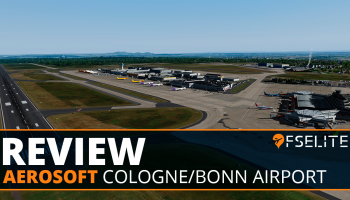 The remaining three options are on/off options for miscellaneous features such as parked cars, static aircraft on the GA apron and dynamic lighting. The instruction manual is easily found with the Open the Documentation button. The manual itself is a brief three page PDF document which is very simple to follow. For the purpose of this review, the configurator tool has all features enabled and with the highest settings selected. I am going to start this segment as I like to do by spawning in at the gate, in this case, stand 1 by the main terminal building. First impressions are always important. When you first spawn in you get an instant feel for the atmosphere surrounding you. The airport felt instantly alive with the animated ground vehicles going about their business on the apron. Passenger buses, logistics vehicles and apron specific vehicles are all animated with dynamic lighting effects. The modelling of the vehicles is quite impressive, although the wheels are not animated like a GSX vehicle is, for example. Looking outside towards the main terminal building through the windshield you get your first glimpse of the implemented PBR (Physically Based Rendering) features. The glass on the terminal building is transparent and reflects the sunlight beautifully and compliments the crisp high-resolution modelling. The external modelling is first class on all sides of the main terminal building. Inside the terminal building, however, paints a different picture. It is basically an empty shell with a few photographs added to represent a departure lounge area. There are no internal architectural details regarding structural supports, passenger waiting areas, passengers or any other attention to detail apart from certain levels to represent a multi-level building. The metal barriers protecting the lower sections of the building reflect really nicely in the sunlight and it reassures you that you have good quality in the modelling here. The floodlights surrounding the entire airport are also created using the PBR method and instantly gives you the illusion that they are metal posts with reflective light casings. The airport buildings, especially the metal roof sections showcase PBR methods to its true potential. There is a good amount of ground clutter throughout the airport, and from what I am seeing only a select few objects are modelled using PBR. Everything that you would normally find scattered around an apron is covered here. You will find fuel tanks, tow trucks, generators, baggage trucks and mobile stairs. All are modelled very well and blend in nicely with the animated apron traffic. The static fuel tankers, in particular, look very impressive with their reflective metal trailers. There is no static aircraft at the main terminal stands which can make the airport feel a little deserted if you are not currently using AI traffic. The flying school by runway 27 does, however, have static GA aircraft parked there which are well modelled, not forgetting the TNT haulage depot right next door. It must be noted that the animations and apron clutter have no noticeable effect on performance so credit must be given here for a job well done for a smooth experience. Venturing further outside of the airport and into the parking lot, the optional vehicles are well made. The reflections on the cars are really eye-catching and enhance the quality of 3-D modelling. The main terminal frontage is of excellent quality with clear, crisp texturing, although the glass is reflective and not transparent. The famous yellow submarine outside the front of the terminal is an iconic statue representing the famous song by The Beatles and has been made to a very good standard. The beautiful contemporary building of the Hampton by Hilton hotel stands proudly outside the front of the terminal building. The hotel has been accurately modelled and the significant colours of the cladding are clearly on show. The surrounding area of the airport has been modelled very well. The variety of the iconic townhouses and estates of Liverpool along with industrial buildings is clear to see and gives extra immersion for an approach into the airport. Moving on to nighttime textures and ambience, this airport scenery changes into something quite different. The taxiways and runway are lit to a good standard and are perfectly acceptable with a nighttime approach. The dynamic lighting of the ground vehicles lights up their surroundings very well and you will also notice the headlights reflecting off the airport buildings. The lighting on the apron from the floodlights is pretty average, to say the least. First of all the colour of the lighting is the wrong shade of white. Bright white is used here when most of the UK airports use soft white with an orange tint. The light itself doesn’t light up all the aircraft on the apron. I am using Ultimate Traffic Live for this experiment and the aircraft are barely lit with some of them just a black shell with a tail logo light on. The ground of the apron is lit very well but sadly the floodlights are missing their target. Sat in the aircraft and you will find yourself sitting in a pitch black flight deck. The lighting works well in the parking lots outside of the airport grounds. The dynamic lighting working with PBR helps the vehicles look very realistically lit. Everywhere else, the front of the terminal and the Hilton hotel are not lit at all. It literally feels like a ghost town and a very, very dark ghost town at that. The terminal building looking from the apron has been given a tiny amount of lighting effect but it is still pretty poor quality for this price range of airport scenery. All of the surrounding area outside of the airport excluding parking lots are not lit during night hours. The wonderful addition of the Liverpool housing estates and industrial buildings go missing at night. It’s such a shame and a missed opportunity for the developers. The immersion factor approaching the airport at night would have been something special if the buildings they have implemented were just simply lit. To more positive things and something that has really impressed me. The textures on the ground of the airport in wet weather conditions. This is simply stunning to look at and I hope my screenshots do it the justice it deserves. The reflective puddles are of the best standard I have seen yet, and not only do they add to the immersion, they also give more depth and texture to the concrete on the taxiways and runway. For the rest of the ground textures, the apron is of a good standard. The concrete tiling looks weathered with the odd splash of oil and fuel spillage which is very nicely done. The paintwork for the taxiway markings looks cracked and raised and very realistic. You will even notice some patches of tarmac that give the impression of the taxiway and runway having been repaired in the past. This is a nice touch and very well thought out. The grass modelling surrounding the whole interior of the airports airside is of a good standard with added weed flowers and long grass surrounding the taxiways and runway. It’s quite possibly a little too green during the summer months for my liking but throughout winter months it looks more realistic with darker shading. This part of my review will be quite brief. I have been using a high-end aircraft addon with modest settings to stress test this package. The performance both in the daytime and at night is simply fantastic. I have had no trouble with frame rates what so ever and I have been exhaustively testing this with every weather scenario set at dawn, day, dusk and night. Quite simply a lot of effort has been put into optimisation and Digital Design has succeeded to the highest level. The configurator tool made no real difference to performance as everything runs so well. You can shave off a couple of frames by disabling the animated traffic but it’s nothing massively noticeable. The approach into the airport was a flawless experience, the airport loaded in with no glitching and without any noticeable performance loss. Taxiing around the airport and to the terminal was smooth and altogether a very enjoyable experience. What we have here is a small airport with a minimal configurator tool. Six basic options which make very little difference to performance however you choose to use it. This package is available at a mid- to high-range price point and when comparing to other developers for the same price, I think we are looking at a slightly overpriced airport. There are a few things that Digital Design could do better, such as better night lighting inside and outside of the airport and better modelling of the internals of the terminal building. Many more features could have been added which would reflect the price a lot better. A lot of marquee developers go above and beyond what is expected these days and include features that can improve the immersion factor quite considerably. Optional static aircraft at the main terminal are commonplace these days with scenery packages and it’s a shame not to see them here. They bring a little more bang for your buck and a little more immersion and are always a welcome addition. I hope there will be updates with added features and night lighting improvements in the future to better reflect this price. The developer Digital Design has been impressing us with past releases. Salzburg, in particular, is a popular addition to any flight simmers library. Liverpool for Prepar3D v4 is a solid release with great visuals and fantastic performance to boot. The detailing of the externals of the buildings is first class. Digital Design’s use of PBR brings more depth and realism to the whole experience. The night lighting, as mentioned before, is a disappointment. The interior lighting of the airport apron is acceptable but on the outside of the airport, they might as well not have bothered adding the nearby towns as you can’t see them at all at night. The front of the terminal building is not visible at night and the impressive Hilton hotel next to it is also not lit and not visible. The wet weather textures are something quite special and Digital Design should be proud of that. The immersion I got from this was just outstanding. I had a big smile on my face when I saw this for the first time and that’s why these developers do what they do. Bravo. In general, this is a good representation of Liverpool John Lennon airport but it could have been a lot better. It almost feels a little rushed in places. Compared to the other popular rendition of Liverpool, it feels fresher, it has more of a surrounding area, detailing all round is better and performance regarding frames per second is better. Would I replace the other rendition of Liverpool with this one? Yes, I would, but you still get a good scenery package for a good price with the other developer. Many improvements are required in future updates. If we get them this will be an outstanding purchase. 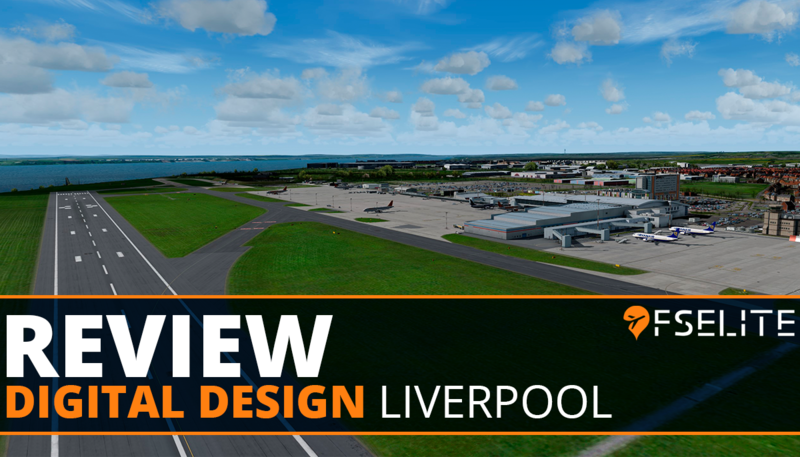 Digital Design's Liverpool (EGGP) is a small airport and a solid purchase for short to medium haul pilots who enjoy flying to and from tourist hotspots. I enjoyed the experience of PBR which enhances the immersion and provides real quality to structures and the environment. I recommend it for your library and with rumoured updates this could potentially be a classic. 7.5 Out of 10 How do we score? | Feedback? The surrounding area with the inclusion of the Hampton by Hilton hotel.